The Best Employment blogs from thousands of top Employment blogs in our index using search and social metrics. Data will be refreshed once a week. Facebook fans n/a. Twitter followers 10,816. San Francisco, CA About Blog Everything about Employment from Reddit. Facebook fans 1,086,516. Twitter followers 470,225. Winston-Salem, NC, USA About Blog The Employment & Labor Insider blog provides insight on class action litigation, employee benefits, labor relations, and compensation. Facebook fans 367. Twitter followers 1,187. Mountain View, CA About Blog Comprehensive up-to-date news coverage on Employment Law, aggregated from sources all over the world by Google News. Facebook fans 22,280,865. Twitter followers 212,880. About Blog “Employment notes” is a Herbert Smith Freehills know-how blog where you will find the latest developments in international employment legislation, regulation and litigation. Facebook fans n/a. Twitter followers 7,494. Century City, California About Blog The Sheppard Mullin Labor & Employment Law Blog is designed to provide employers breaking news, insights & legal analysis on issues facing employers today. Sheppard Mullin is a full service Global 100 firm with 750 attorneys in 15 offices located in the United States, Europe and Asia. Facebook fans 772. Twitter followers 2,941. Global About Blog The Employment Law Worldview Blog aims to interest and educate, to stimulate discussion, to provoke and sometimes just to amuse HR and other practitioners around the world. Through contributions from our own Labor & Employment lawyers, along with occasional guest writers, it provides a unique global insight into practical and legal HR issues relevant to employers everywhere. Facebook fans 2,002. Twitter followers 8,674. Global About Blog DLA Piper is the only global commercial law firm in Norway with lawyers located in countries throughout the Americas, Europe, the Middle East, Africa and Asia Pacific, positioning us to help companies with their legal needs anywhere in the world. Facebook fans 1,094. Twitter followers 29,721. Facebook fans 989. Twitter followers 3,953. About Blog An Employment Law and Litigation blog from Orrick. Orrick is a global law firm focused on serving the Employment, Technology, Energy & Infrastructure and Finance sectors. Facebook fans 1,187. Twitter followers 5,303. Europe About Blog Fieldfisher is a European law firm with market leading practices in many of the world's most dynamic sectors. We are an exciting, forward-thinking organisation with a particular focus on technology, finance & financial services and energy & natural resources. Toronto About Blog First Reference is a publisher of Canadian compliance-based payroll, employment law & internal control resources for businesses, hr & professionals. Scotland, UK About Blog Brodies is the Scottish headquartered law firm offering clients the largest specialist legal resource in Scotland, delivering services of the highest quality to Scottish, UK and global organisations. Its Specialties are Law, Property, Banking & Financial Services, Corporate, Dispute Resolution & Litigation, Employment, Pensions& Insurance. Facebook fans 583. Twitter followers 5,597. United Kingdom About Blog Cripps's Employment blog provides the latest updates on labour and employment law and personal legal services at workplace. Facebook fans 126. Twitter followers 1,170. United States About Blog BT Currents is managed by the attorneys in Barnes & Thornburg’s Labor & Employment Law Department. It’s designed to be your resource on employment law developments across the country. BT Currents will help employers across all industries stay aware of and respond to these developments. 1 Elk Street, Albany, NY About Blog The Labor & Employment N.Y. (“LENY”) blog is a law blog sponsored by the New York State Bar Association’s Labor and Employment Law Section. Among other primary objectives, the Section’s mission statement requires the Section “to disseminate information and exchange ideas relating to the development and practice of labor and employment law, both substantive and procedural,” . Facebook fans 4,689. Twitter followers 8,884. Facebook fans 315. Twitter followers 621. St. Louis, Chicago, Belleville About Blog SimplyHR regularly provide day-to-day HR advice across all industries throughout the United States on topics including disability, family medical leave, absence, return to work, anti-discrimination, non-competition, traditional labor & the list goes on & on. We walk employers through complicated laws and difficult employee issues. We also defend employment and benefits-related lawsuits. Dublin, Ireland About Blog Firstaff is one of the longest established personnel consultancies in Ireland, with experience and knowledge at the core of what we do. Since 1967 we have been committed to a total service philosophy guaranteeing a first class, professional service before, during and after recruitment. Facebook fans 1,230. Twitter followers 235. California About Blog This law blog provides news & commentary on developments in public agency management, labor relations and employment law in California. Topics include workplace policies, disability and discrimination in the workplace. Facebook fans n/a. Twitter followers 442. US, UK, China and Australia About Blog Employment Law Lookout: Insights for Management is a resource for employers seeking intelligent discourse and updates on today’s most pressing workplace issues. Facebook fans n/a. Twitter followers 8,534. Melbourne, Australia About Blog Thomson Geer’s Employment & Safety team helps organisations of all sizes in various industries with employment & safety matters. Their employment partners have specialist expertise in health & safety, discrimination & enterprise bargaining. Through this blog, they hope to share with you their industry insights & experiences in relation to all aspects of employment, safety & workplace relations. Seyfarth Shaw California About Blog California Peculiarities Employment Law Blog, Published by Seyfarth Shaw LLP covers legislative updates & commentary on employer laws in CA including harassment & wage statements. Los Angeles, California About Blog Los Angeles' top employment & discrimination law firm Hennig Ruiz - specializing in employment rights, retaliation law & whistleblower protection. Facebook fans 29. Twitter followers 228. Cleveland, Ohio About Blog Ohio Employer's Law Blog is a blog for employers about employment law and labor law by Jon Hyman. It provides practical employment law information for businesses in Ohio and beyond. Facebook fans 171. Twitter followers 3,355. Toronto, Ontario About Blog Whitten & Lublin is an employment and labour law firm providing expert legal counsel to both employees and employers in all aspects of employment law. Facebook fans 82. Twitter followers 882. Facebook fans 231. Twitter followers 4,575. Facebook fans 819. Twitter followers 4,129. Washington, DC About Blog This Washington D.C. blog by Alan Lescht & Associates, P.C. discusses legal issues related to Employment Law. The firm’s employment lawyers have vast experience representing federal employees embroiled in disciplinary disputes, private-sector employees with wrongful termination claims, and executives seeking to enter into or exit from complicated employment and restrictive covenant agreements. Facebook fans 273. Twitter followers 142. About Blog Global Workplace Insider a cutting-edge blog led by the global employment and labor team of Norton Rose Fulbright, designed to deliver diverse insight on legal and business developments as well as trends impacting employment and labor matters in various regions around the world. Facebook fans n/a. Twitter followers 12,429. California About Blog Polsinelli's Labor & Employment attorneys advise management on complex employee relations and workplace issues. Employers, whether large or small, face an ever-growing web of workplace regulations and potential entanglements with employees. With employment litigation and advocacy experience as our strength, preventing legal problems from arising is our goal. Facebook fans 1,059. Twitter followers 159. Unionville (Markham), Ontario About Blog Minken Employment Lawyers is a specialty employment law boutique that provides expert legal services on a full range of workplace issues to employees, employers, law firms, corporate counsel and human resource departments in a variety of industries. Facebook fans 88. Twitter followers 571. Philadelphia, PA About Blog The HRLegalist™ is an online resource for corporate employers, HR professionals, C-suite executives, and corporate counsel on the latest developments and trends in labor and employment law as well as analysis and commentary regarding best practices for employers. Facebook fans 253. Twitter followers 95. Baltimore, MD About Blog The Labor & Employment Report is your one-stop blog to learn about the latest developments in labor and employment law issues. Published by Shawe & Rosenthal LLP, Management’s Workplace Lawyers, this blog informs human resource professionals, corporate counsel, business leaders, policy makers, journalists, judges, and other attorneys about critical labor and employment issues. Facebook fans 7. Twitter followers 99. NYC, Chicago, San Fran, & DC About Blog Outten & Golden LLP's goal is to help our employees understand their rights, to empower them to protect their interests, and to advocate on their behalf. Facebook fans 251. Twitter followers 585. Ottawa, ON About Blog An employment law blog for employers and employees. Published by Sean Bawden of Kelly Santini LLP. Facebook fans n/a. Twitter followers 2,356. New York, Florida, Kansas About Blog With 64 labor, employment law and employee benefits attorneys devoted to the representation of management, Bond Schoeneck & King, PLLC has one of the largest Labor and Employment Law practices in the Northeast. Toronto, Ontario About Blog Baker & McKenzie’s Canadian Labour and Employment Law blog provides employers with up to date information on legal developments that impact workplace policies and procedures, human resources management, employment agreements, discipline and dismissal, and employment-related litigation. Facebook fans 11,138. Twitter followers 362. State College, PA About Blog Lawffice Space is an employment law blog, focusing on Pennsylvania and Federal Law. It provides the latest and most interesting case law, statutory law, and current events from the world of employment law. Facebook fans 90. Twitter followers 3,057. Chicago, Illinois About Blog Helping employers manage their biggest asset. A preeminent local government law firm. Clients rely on Ancel Glink's labor team for the best advice in managing their biggest assets - their employees. Facebook fans 396. Twitter followers 70. Toronto, Ontario, Canada About Blog Lecker & Associates, Toronto Employment and Business Lawyers have been providing services to wrongfully terminated employees for over 25 years. As an advocate for employees we specialize in cases involving wrongful dismissal, constructive dismissal, employment law in Ontario, employment contracts, sexual harassment in the workplace, short and long term disability claims. Facebook fans 697. Twitter followers 381. New York City About Blog Proskauer's Law and the Workplace Blog provides timely insights and analysis on national and state-specific legal developments impacting employers. Facebook fans 272. Twitter followers 87. Montreal About Blog Vigilant counsels companies on employment issues across the Northwest and California. For a flat monthly fee employers can get unlimited legal advice from employment and labor attorneys and counsel from HR professionals and safety experts on employment matters. Dallas, TX About Blog This blog by The Devadoss Law Firm, P.L.L.C. aims to bring news and commentary on Federal Employment and Labor Law issues to residents of Dallas, Washington D.C., Atlanta. Prairie du Chien, WI About Blog Welcome to the Labor and Employment Law Update where attorneys from SmithAmundsen blog about management side labor and employment issues. They cover topics including addressing harassment and discrimination in the workplace, developing labor law, navigating through ADA(AA), FMLA and workers’ compensation issues, avoiding wage and hour landmines, key legislative, case law and regulatory changes. Facebook fans 126. Twitter followers 125. Toronto About Blog A blog about employment and labour law with a focus on Ontario and Canadian wrongful dismissal cases, legislation and commentary. Facebook fans 7. Twitter followers 2,713. About Blog Epstein Becker & Green, P.C., is a national law firm with a primary focus on health care and life sciences; employment, labor, and workforce management; and litigation and business disputes. Facebook fans 239. Twitter followers 2,610. Nashville, Tennessee About Blog King & Ballow was formed in 1969 in Nashville, Tennessee by Frank S. King, Jr., and Robert L. Ballow. King & Ballow continues to develop its other practice areas and to expand its client base beyond the media business; it is currently recognized as one of the nation’s foremost law firms in the fields of media and labor law. Milwaukee, WI About Blog Enochs Law Firm is a boutique law firm in Milwaukee focusing primarily on labor & employment matters. Facebook fans n/a. Twitter followers 1,332. San Diego, California About Blog This San Diego, California blog by Grady & Associates discusses legal issues related to Employment Law - Employee. We hope you'll provide your feedback. Los Angeles, CA About Blog Strong Advocates's employment law attorneys handle cases of wrongful termination, discrimination and workplace abuse. And they work passionately to protect their rights. Facebook fans 127. Twitter followers 5. Washington, USA About Blog WELA’s mission is to enforce and advance employee rights, in recognition that employment with dignity and fairness is fundamental to the quality of life. We do this by promoting and increasing public awareness of the rights of individual employees; enhancing the quality of legal representation of employees; advocating for employee rights before courts and legislative bodies. Facebook fans 56. Twitter followers 29. 5 locations statewide About Blog The Labor & Employment Group is dedicated to providing up-to-date, useful information to allow employers and human resources professionals to react to rapidly evolving case law, statutes, and regulations that control the California workplace. This blog’s objective is to serve as a forum to discuss labor and employment topics, issues and legal news. Facebook fans 294. Twitter followers 375. Lambertville, NJ About Blog David Zatuchni Zatuchni & Associates represents the interests of employees from Wall Street to Main Street, from Staten Island to Trenton, who have been injured by discrimination, harassment, and illegal employment practices. Facebook fans 237. Twitter followers 105. St. Louis, MO About Blog Employer Law Blog has been helping business people navigate employment law. Recognizing that every business with employees faces challenges that can impact their growth and profitability, Sandberg Phoenix attorneys are committed to sharing their knowledge of, experience with and passion for employment law. Facebook fans 273. Twitter followers 258. Troy, MI About Blog This blog by Akeel & Valentine, PLC is geared toward Troy, Michigan residents interested in news and information on the topic of Employment Law. San Antonio, Texas About Blog San Antonio Employment Law Blog focuses on labor cases involving wrongful conduct by the employer in Texas. Ohio About Blog Elfvin, Klingshirn, Royer & Torch, LLC is a Northeast Ohio law firm representing individuals as plaintiffs or defendants, classes of individuals, public entities and companies (employers), in employment law and related practice areas. Facebook fans 95. Twitter followers 16. USA About Blog The General Counselor Employment Law Blog is for in-house attorneys, business owners, and other executives and employers. It provides employment law news with special attention to Illinois employment law. The blog is maintained by the Employment & Labor Law Practice Group at Arnstein & Lehr LLP. Facebook fans 98. Twitter followers 408. New Jersey About Blog Rabner Baumgart Ben-Asher & Nirenberg, P.C. is a team of well-rounded attorneys, who craft creative and thoughtful solutions in their representation of employees, entrepreneurs and small businesses. They are a New York and New Jersey employment law firm, with an emphasis on claims involving discrimination, harassment, whistleblower retaliation, family and medical leaves and employment contracts. Facebook fans 25. Twitter followers 69. 101 Tremont Street, Suite 1008 About Blog This blog by Regan Lane LLP aims to bring news and commentary on Employment Law for Employees issues to residents of Boston, Massachusetts. The firm focuses its practice on Plainitff-side employment issues and has the collective experience and knowledge to service all of our client’s legal needs. Facebook fans 425. Twitter followers 32. Harrisburg, Pennsylvania About Blog This blog provides Lemoyne, Pennsylvania residents with information on Employment Law from Clark & Krevsky LLC. Beverly Hills, California About Blog This Los Angeles, California blog by Law Offices of Lauren Abrams discusses legal issues related to Employment Law. The Law Office of Lauren Abrams is a boutique law firm specializing in: -Employment Law -Discrimination Law -Retaliation Law -Overtime Law -Wrongful Termination -Sexual Harassment Cases, they understand the delicate and personal nature of employment matters. Facebook fans 18. Twitter followers 100. Des Moines, IA About Blog Iowa Employment Law Blog is written by Patrick Smith of Bradshaw Fowler Proctor & Fairgrave, PC's Employment & Labor practice group focusing on matters related to employment & labor litigation, disputes, benefits, unfair practice, and wage & hour claims in Iowa. Oakland, California About Blog Siegel & LeWitter has been one of the most highly regarded San Francisco Bay Area employment law firms, representing employees or plaintiffs in individual and class action employment litigation and representing labor organizations. Atlanta & Nashville About Blog At Mays & Kerr, we represent individuals and small businesses in employment law matters. Our individual practice is focused solely on wage and hour cases under the Fair Labor Standards Act. Federal law requires that employees be paid for all hours worked, including hours worked off the clock, and we routinely recover unpaid wages for employees. Facebook fans 135. Twitter followers 254. South Carolina About Blog Haynsworth Sinkler Boyd attorneys represent private and public employers in every facet of management-side employment law, including discrimination and harassment claims, wrongful-discharge, workforce reduction planning, immigration issues, and restrictive-covenant enforcement. Haynsworth Sinkler Boyd employment lawyers also work with clients on traditional labor matters. Facebook fans 227. Twitter followers 481. Portland, Maine About Blog Maine Employee Rights Group represents employees in the following types of cases: Discrimination, harassment, whistleblower retaliation, unpaid wages/overtime, denials of disability-related accommodations, medical leave disputes, denials of benefits, and workers' compensation. Facebook fans 55. Twitter followers 14. United States of America About Blog Employment Law Landscape will communicate news & Trends for labor & employment law for business owners, HR professionals & In-House Counsel. The attorneys at Schiff Hardin created this blog as a way to communicate news, developing trends and significant events in labor and employment law. Facebook fans 242. Twitter followers 1,093. KY, IN, TN About Blog Tyson Gorman leads Wyatt, Tarrant & Combs, LLP’s Labor & Employment Service Team. Its representes both private and public sector employers in a number of traditional labor law matters, including employer defense in labor arbitrations of all types, employment discrimination litigation, wrongful discharge and related tort cases, union organizing campaigns, and collective bargaining negotiations. Nashville, TN About Blog The Employment & Consumer Law Group represents consumers who have been ripped off and employees with legal claims against an employer. Representing employees and small businesses in all employment matters. Representing consumers victimized by fraudulent or unethical business practices. Facebook fans 230. Twitter followers 16. Massachusetts, USA About Blog Doorways Employment Law, Specializing in employment law counseling, strategic advice and representation to individuals and businesses across Massachusetts, Doorways Employment Law is a virtual employment law practice, leveraging the power of technology to connect with clients in the most efficient, convenient and cost-effective way possible. Facebook fans 8. Twitter followers 35. About Blog Barry B. Fisher LL.B. is a mediator and arbitrator in Toronto.His practice focuses on both labour and employment law matters. He is one of the most often chosen mediators for employment law cases under the Ontario Mandatory Mediator Program. Barry is a frequent presenter at seminars and educational courses on issues relating to employment law, labour law, and ADR. California About Blog Our Orange County, California blog offers news and insight on issues of Employment Law. Washington About Blog This blog particularly focuses on Washington State and 9th Circuit court decisions and the rulings of the Washington Public Employees Relations Commission. It covers court rulings and legal developments related to collective bargaining rights, wage and hour law, employment discrimination and employee civil rights. About Blog Employment law blog, An advocate's guide to, tactics, tips and employment law updates from employment law barrister Charles Price. Tustin, CA About Blog At Hogie & Campbell our commitment to employment law has brought together Employment Lawyers that are experienced at fighting for employees who have suffered from Workplace Discrimination, Disability Discrimination, Sexual Harassment, Race Discrimination, Gender Discrimination, Pregnancy Discrimination, denied Pregnancy Disability Leave (PDL) or Family Medical Leave (FMLA) and more. Facebook fans 272. Twitter followers 1. About Blog Labor and Employment Law blog by Genova BurnsLabor and Employment Law . The firm specializes in the representation of employers in all aspects of Employment Law & Litigation. St. Paul, Minnesota About Blog Abrams & Schmidt's law blog provides news & commentary on the legal needs of Minnesota employers. Topics include unemployment insurance, FMLA and public employer issues. New Jersey About Blog Frank is the founder and principal of Steinberg Law, LLC. His practice is focused on business litigation, employment, aviation and sports law. Glasgow About Blog We are Employment Lawyers in Glasgow who specialise in providing an excellent quality service. We deal only with employment cases. We provide good quality, practical, client focused advice to a wide range of individuals and organisations on the full range of employment issues from the stage of recruitment through to employment tribunal proceedings and appeals. Facebook fans 3. Twitter followers 189. 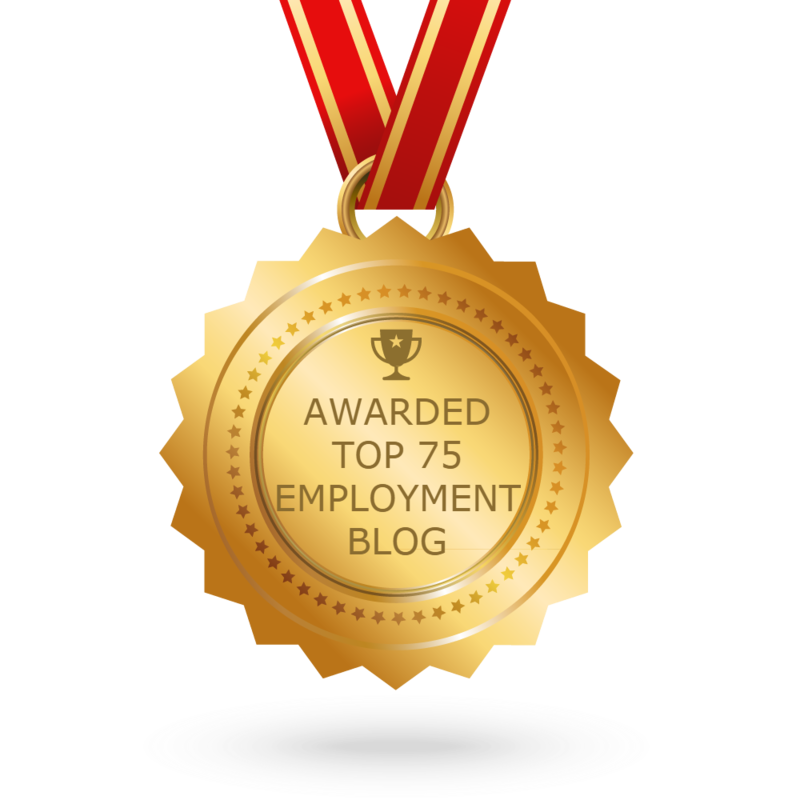 CONGRATULATIONS to every blogger that has made this Top Employment Blogs list! This is the most comprehensive list of best Employment blogs on the internet and I’m honoured to have you as part of this! I personally give you a high-five and want to thank you for your contribution to this world.